Did you know air conditioner maintenance is a great way to save on costly HVAC repairs in the future? Here in South Jersey, we’re practically dependent upon our air conditioning systems in the summer. And when it comes time to fight off the heat, you need your system operating at its absolute best. To get the best out of your air conditioning this year, be sure to seek out professional maintenance. McAllister’s team carries all of the skill, experience, and knowledge needed to ensure you get the best possible air conditioner maintenance. We’ve built our reputation on exceeding expectations, and our results are completely guaranteed! Need professional air conditioner maintenance in Somers Point, Ocean City, Atlantic City, or surrounding areas? Look no further than McAllister! Contact us online or over the phone at (877) 862-7321. Serving Somers Point & the Surrounding Areas—Call (877) 862-7321 Today! At McAllister, our experts take great care to ensure your system gets all of the services it needs to perform perfectly. We couple superior training with top of the line equipment to completely restore and optimize your air conditioner in South Jersey. Ensure your family stays cool this summer by scheduling your annual air conditioning maintenance with McAllister today. Contact us online or over the phone at (877) 862-7321. There are two integral keys to routine maintenance: prevention and maximized performance. Without these, you’re paying more, and getting so much less out of your cooling system. Trust the NATE-certified experts at McAllister to keep your air conditioning system working at its best! Contact us to schedule air conditioner maintenance in South Jersey, including Somers Point. Maintenance should never be regarded as a one-off task. Like any other piece of equipment, maintenance results are always best when pursued regularly. Get your system the care it needs and ensure you’re equipped to handle anything our South Jersey weather can throw at you! McAllister offers our Somers Point patrons maintenance plans that cover all of your bases. These plans are tailor-made to accommodate your specific needs and provide all of the care and services your system needs to operate at its best. Contact our South Jersey HVAC company to learn more about our superior HVAC maintenance and how we can help you get the most out of your heating and cooling system! We’ve been providing our reliable services to homeowners throughout the South Jersey area since 1876. You can trust our team to keep your air conditioning system running all summer long. 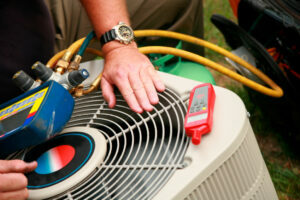 For dependable air conditioning maintenance in South Jersey, choose McAllister. Contact us online or call us at (877) 862-7321 at to schedule air conditioner maintenance in Somers Point.